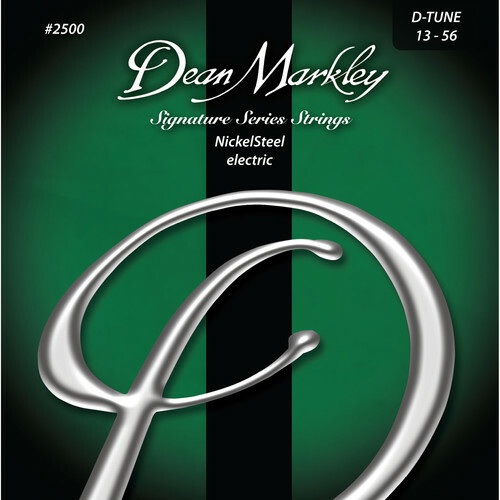 D-Tune gauge NickelSteel Electric Signature Series Guitar Strings from Dean Markley are made of nickel-plated steel. The bass strings are hand-wound slowly over a hex core. The outer-string wrap maintains 100% contact with the core and results in a string that vibrates completely for maximum sustain. It delivers a warm, full sound distinctive of classic rock and roll. In addition, the core-to-wrap ratio makes bending easier than with other strings. This set includes gauges ranging from .013-.056. Box Dimensions (LxWxH) 4.2 x 4.0 x 0.5"